From Saigon we pass TanAn to MyTho for visiting a snake farm. Then go to CaiBe for the Floating Market. Stop on the way for some sightseeing. Lunch at fruit garden. Boat trip to Binh Hoa Phuoc island in CaiBe. Small boat along the canal, to see the day life of southern people. Overnight in CanTho. AM. Boat cruise to visit the floating fishing communities and the Cham village. 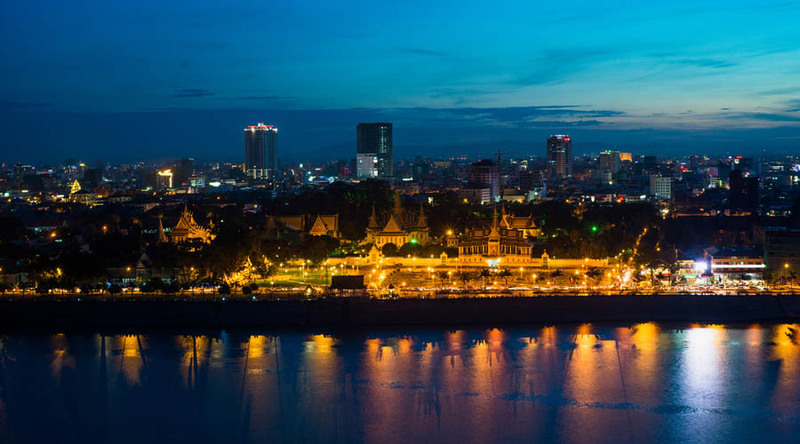 Take a speed boat to Phnompenh, meet and transfer to Hotel. Lunch at a local restaurant. PM. Begin city tour with a visit to Wat Phnom the historical capital of Phnom Penh. Proceed to the Independent Monument, Royal Palace, Silver Pagoda and the National Museum of Fine Arts. Dinner and O/N in Phnom Penh. AM. Transfer to boat pier for the speed boat to SiemReap. Arrive and transfer to hotel. Lunch at Phaka Chhouk restaurant. PM. Visit the Southern Gate of Angkor Thom and the famous temple of Bayon. Move on to the Phimean Akas Temples, The Elephants Terrace & Leper King. Then watch sunset over Angkor Wat from the summit of Phnom Bakheng. Dinner at Chao Praya restaurant with traditional Apsara dance performance. AM. Breakfast at hotel, Visit Banteay Srei, the most beautiful pink sandstone temple and proceed to visit the temple of Banteay Samre. Lunch served at local restaurant. PM: Visit the highlights of the grand temple circuit. This includes Neak Poan, Eastern Mebon, Pre Rup and Preah Khan. Return to town for dinner. AM. Breakfast at the hotel. Visit the smaller temple circuit which includes Prasat Kravan, Sras Srang, Banteay Kdei, Takeo and Ta Prohm. Lunch served at local restaurant. After breakfast, free time for shopping and a final look at Siem Reap, then check out and transfer to airport for flight back. Arrival Saigon, pick up and transfer your hotel. End of tour. – All other accounts are not mentioned in the above inclusion.